Sugar and Dust is the story of a young, troubled woman, Isabel, who seeks meaning after her mother's untimely death by moving to rural Tanzania. While in Tanzania, she finds herself intertwined in a drug trade that could ultimately spell freedom for the child brides Isabel has befriended in her new home. The deal Isabel makes with the drug dealers is this: for every kilo of cocaine she successfully transports, she receives one counterfeit passport out of the country for a child bound by the chains of premature marriage and abuse. The stress of the drug trade, the shocking customs of the tribal culture in which she is immersed, and her choice to come face to face with her mother's suicide ultimately create a story of strength, belonging and identity (even for those who feel alone). I have malaria. It took me a while to realize because everything is so hectic right now, sometimes I don’t know what I’m feeling. I woke up in the middle of the night and I thought I was drunk: the way my head was spinning and the way my fingers felt numb. You know no matter how old you are you always want your mom when you’re sick? That’s why I’m writing to you. Every time the wind blows through my open window, it hits the back of my neck. I fall into a fit of sweaty chills, and I keep wishing you were here to wrap blankets around me. I also see things I know aren’t here, like hyenas in my room. Or you. The nurses say that’s normal when you have malaria, hallucinations. It doesn’t feel normal to me. I had a dream that you were here in Africa, carrying a bucket of water on your head. It felt so real, it made me think that maybe I saw you do it before, like my dream was a memory. I wish you could see me here. I think you’d be proud. Even if you didn’t say anything, I think you would’ve been proud. Maybe, you would’ve been so proud, that you would’ve forgiven me for not being able to fix everything. That’s always been my goal. This is what I knew of tragedy: run as far and as fast as you possibly can. The plane touched down on red African dust exactly five months and two weeks after the death of my mother. My shoulders were sore from hunching under the weight of her loss, and my legs burned with the fire of the restless. My heart slowed down the longer I stayed on that plane. The burning subsided in my limbs and peace dripped into my veins the farther I travelled from the place that I had known her. I did not stop to consider the fact that perhaps Africa had known her, too. I smelled Tanzania before I saw her. She was warm bodies and smoke and sweet milk. I closed my eyes and willed the scent to seep into my pores and melt into my hair. This smell was not familiar and that was all I wanted in those days: the conscious act of not being reminded. With closed eyes I listened to those around me murmur and stir as the wheels of the plane hit the tarmac. I tried to pick out phrases or syllables I had encountered in my Swahili book that rested in my lap. The language blended and flowed together too quickly for me to distinguish one word from another. I was comforted by such newness. One by one, the passengers filed down the aisle of the plane and along a narrow staircase onto tired pavement. I bunched my skirt in my hand and pulled it up above my ankles to make my descent easier. It was not humid, but it was hot. My legs sweat and stuck together underneath the skirt. My suitcase lay sleepily on the tarmac, tipped up against another bag, thrown haphazardly from the plane. I grabbed it and began to follow the crowd as they filtered into the night with hugs and songs and whispers from the airport. And this is how I arrived in Africa: with four long skirts in a suitcase, a pocket Swahili dictionary, a broken heart, and a fourteen-month-job contract at the nearby school. I swept a mass of curly hair into a bun on top of my head and ensured everything I owned was accounted for. Seeing my life in a suitcase lodged a heaviness in my throat. “IsaBEL! IsaBEL, where are you my DEAR?” It felt strange, to hear the familiarity of my own name in a place so foreign. “ISABEL! I know it is one of you!” the voice continued to ring through the colorful crowd under the night sky. Underneath the street lamp that illuminated the tarmac stood a thin, small woman wrapped in colorful pieces of fabric. A large purple cloth encircled her entire tiny body from her ankles all the way up past her chest, pinned with a safety pin at her shoulder. Smaller, thinner squares of patterned fabrics were tied around her shoulders and neck. The pictures in my dictionary were strikingly similar to the woman before me: this is how the women from Sana in this area dressed. In my long skirt, I picked up my pace, my large suitcase rumbling behind me over the uneven pavement. I towered over the woman. The sweaty skirt felt uncomfortable and athletic shoes on my feet were clunky and awkward in the heat. I was suddenly self-conscious of the mass of curly hair on top of my head as I spoke to this small, confident woman with a cleanly shaven head and perfectly drawn eyebrows. Nylie continued to hold my hand as she talked. “The madam who owns the school? She told me you would be arriving this week, but she told me only to come greet on Monday when the school day started. But Richard here does not speak English so well, so I wanted to come greet you the moment you arrived!” Nylie gestured with her head to a man standing quietly to her side. He, too, was dressed in large cloths, but in various hues of red, instead of the purples that Nylie wore. He smiled shyly in my direction. I attempted a formal Swahili greeting, but it caught in my throat the way nervous words do. Richard smiled at the attempt and offered his response in soft Swahili. “Listen to your Swahili, Madam!” Nylie exclaimed, and finally released my hand. The three of us began walking from beneath the street lamp into the starlit night where I could see a few cars parked in the distance. “You will love Tanzania so soon, God willing!” Nylie led the charge into the dark with her rubber sandals. Richard was the driver for Amani Manor, the school for which I would be working. He unlocked a dusty red jeep parked in the lot and heaved my suitcase into the backseat with Nylie. He brushed off his hands before sticking the key in the ignition and twisting gently for several minutes before the engine rumbled and yawned. I sat in the passenger’s seat, dust sticking to my sweaty skin. Nylie continued to chat as we drove along for a few minutes on a paved road with no signs and no markings. Then, we took a sharp turn off of the highway and into the dust. For a moment, I wondered if we had made a wrong turn, but Richard kept the car steadily rumbling down the rocky path, avoiding termite mounds and large rocks. I had heard stories, everyone had, about people who go into a foreign country and don’t return. Perhaps this was how it happened: a jet-lagged American, a gregarious young woman and a driver tumble into the night, never to be seen again. My father’s wife had concerns about how clearheaded I was to embark on this journey. In her mind, I was a tired twenty-five year old with a heavy heart who could stumble into the savannah and never find her way back out. Theresa sat me down one day on the couch in my father’s house and held both of my hands. She told me that she loved me and she knew I needed to go, but to promise her I would come back home, if not for her then for my father. I nodded solemnly and swore to her I would. My eyes burned and my ribs quivered. Hot tears burned rivers down my cheeks. Theresa reached out and squeezed my shoulder. But I was not crying because I would miss her, or my father, or or out of fear of the unknown. I cried because I knew my own mother would never have made me promise her something like that. I laughed, too, at the strangeness of the situation. Covered with dust in a car with people I did not know in a continent that I did not belong. That’s all humor is, after all. A juxtaposition of unmatchable things. Just then, Richard slowed down the car even further. In the dark I could make out houses now, small and square with rounded mud corners. In the distance, specks of light radiated, some from fires outside of the homes, some from the eerie blue glow of solar light bulbs. Voices drifted in the air, people laughing, a baby crying, distant singing. My heart lowered gently from my throat to my chest as we came into the village. The voices grew louder and the fires seemed brighter, and soon shrieking children surrounded the car: screaming and waving and laughing as the jeep rumbled down the road. Goosebumps sprouted from my skin like houses from the dust: unnoticeable at first, until they covered the entire brown land. Richard steered the tired car past a watchman who waited at the wooden gate of the school and moved slowly to unlatch the metal hook. The driveway to Amani Manor was lined with rose-colored begonias that grew like vines up the wire fence. The school was painted a friendly shade of yellow, and the classrooms formed a square around a central courtyard. In the middle of the courtyard was a single flagpole, ringing listlessly as the metal snaps hit the pole. “Amani Manor, we have arrived!” Nylie sang as Richard put the car into park. He quickly walked around to the back seat and set my suitcase in the dust. Nylie pulled a key from around her neck and unlocked the large wooden door closest to the entrance of the school. She struggled to force it open. I felt a small pinch on my elbow and spun around to see what African insect had surely stung or bit or feasted on my arm. But there was no insect; no menacing creature at my side. Instead, there was a small boy with fabric tied around his shoulders just like Nylie, who watched with bright eyes for my reaction. The child clapped dusty hands and shrieked with laughter, then ran away on bare feet. Behind him, three other children had followed, all giggling loudly; giddy with the idea that the light skinned woman had spoken and her skin felt just the same as theirs. Nylie muttered under her breath and clicked her tongue in the children’s direction, which made them laugh even louder. With that, she forced the door open and the lights of the room crackled awake. “This is your room, Madam Isabel,” Nylie announced, and walked into the classroom that had been altered for the purpose of living. In the corner was wedged a twin-sized bed on an intricate mahogany bed frame. Above the mattress hung a mosquito net heavy with dust. There was a dresser in the same dark wood with a few knobs missing, and a mirror leaned against the wall. A sink rested in the corner and a few colorful cloths and drawings clung to the paint. I sat down on the bed and looked around. The light gave the room a greenish hue in the dark and I felt instantly lonely. “It’s okay for you?” Nylie asked, and sat down next to me. She twisted her wrists in circles and watched her bracelets topple down her forearm. “You don’t fear sleeping alone?” Nylie asked. She continued to watch the shiny plastic reflect against the iridescent light. I nodded and melted deeper into the mattress under the weight of her words. I did not yet understand decisions as privilege. I had not yet seen what a human would do for the right to choose. The room was suddenly filled with a low humming; a static crinkle filled the air then the lights fluttered off. I sat up quickly. “What happened?” I asked, suddenly aware of the noises that accompany the dark. Nylie sighed a big heavy sigh that was more dreamy than frustrated. “Oh, the power is cut my dear,” she said. I wondered if she had closed her eyes as she lay on my mattress. I wondered if she was dreaming about sleeping alone. “Well, when will it be back on?” I kicked my feet around the base of my bed to search for the shoes I had slid off of my feet. As if there were somewhere I needed to go. As if my shoes could bring back the light. “Oh, I’m not sure. Maybe late this evening. Maybe for a few days.” She was not distressed in the slightest. “And why is the power cut?” The darkness suddenly seemed suffocating. I waited for her to explain more. “Is that allowed?” I asked. My eyes began to adjust to the light. The moon outside shone navy light into my room. The outline of homes and specks of fire emerged in my window. I nodded quickly, although Nylie surely could not have seen my gesture. “I am happy you have arrived, Isabel!” Nylie said and pressed the key to the room into my hand. Her plastic sandals slapped the cement floor and the blue light seeped into the room as she opened the door. I had not felt this type of alone in many, many years. It welled up in my chest and sent tears down my cheeks, but not from the sadness. Instead, they were tears like running in the wind: exhilarated tears. Powerful tears. Freedom tears. I used the last bit of my cell phone battery as a flashlight as I fished a clean T-shirt out of my suitcase and stripped the sweaty skirt down around my ankles. I found baby wipes Theresa had packed and wiped down my entire salty body. The sounds of a rural world I did not know screamed in my ears, as I lay wide awake on the mattress. The deep rumbling groans of cows. The crows of a night rooster. Babies cried and dogs yipped and crickets numbed the pulsing in my brain. I thought about the child who had pinched my elbow and wondered what his home looked like. Who was sleeping with Nylie in her bed tonight? Perhaps a younger sister, a boyfriend, an aging mother? With my eyes closed, I recalled the last time I shared a bed with Ivy Supeet. I was nine years old in my maternal grandmother’s home in New Orleans. My father had sent me out there for the summer to be with my mother, and I had agreed to go. Ivy didn’t get out of bed that summer. I cooked her ramen noodles with nine-year-old hands and carried hot bowl upstairs to her room. Sitting on her bed, I begged her to eat the noodles, and then begged her to open her eyes, and then begged my father to not make me go back to New Orleans anymore. He never made me go back, not even for the funeral. Sometimes, I wish he had. 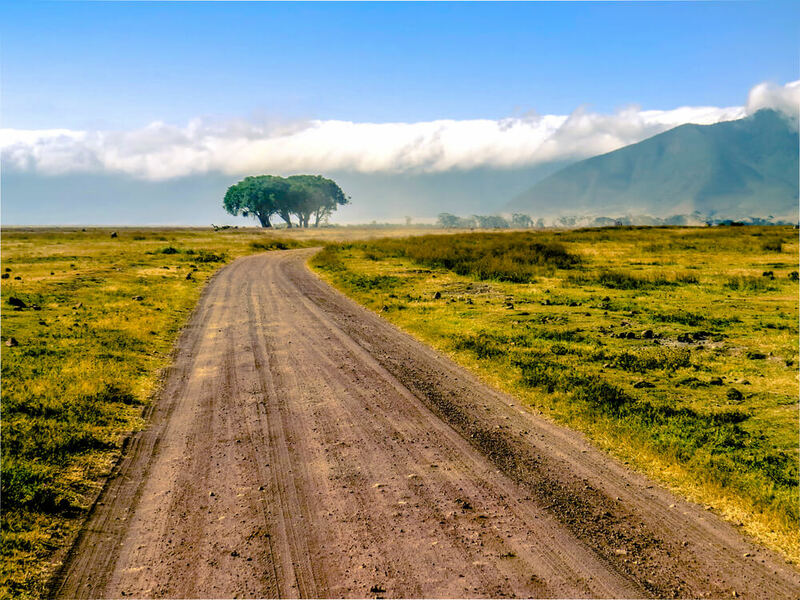 After spending several years in East Africa, Ella wrote and maintained a popular blog known as “How Far I Am” about living life in a traditional Maasai Village. She has been published in a wide range of magazines including Elephant Journal, Yoganonymous, and Sivana Blog. Read more articles by Ella Kerr. All original work attributed to Ella Kerr © 2018 Ella Kerr.